Pronation is a natural mechanism of the human body and refers to the way your foot rotates inward for impact distribution upon landing. Neutral pronation is critical to proper shock absorption. Overpronation of the foot occurs when your weight rolls onto the inner edges of your feet and your ankles roll inwards after landing, causing strain. Custom moldable orthotic insoles are designed to improve alignment and provide the mechanics you need to reduce pain and prevent further injury. If the mechanics of your foot are a little bit off, it can throw off the alignment of your entire body. Excessive pronation of your feet is quite common but if untreated can lead to degenerative wear and tear and chronic discomfort in the knees, hips or spine. Overpronation usually causes overuse type injuries, occurring most frequently in runners and people who have flexible, flat feet. As a result, excessive pronation often leads to conditions such as shin splints, plantar fasciitis, heel spurs, metatarsalgia, post-tib tendonitis and/or bunions. 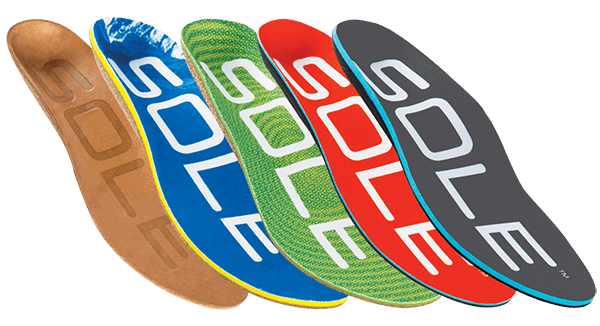 The orthopedic shape and personalization of SOLE’s footbeds prevent lateral movement and provide the neutralized alignment and stability you need to prevent injury and get back on your feet. I have had runner’s knee for many years and my feet overpronate. Physio and strengthening my quads gave varying degrees of success. My sports physician suggested insoles and the athletic supplies store suggested these. I’ve now been using the insoles for a couple months and my knees feel so much better. I thought I had to give up running but I’ve increased my mileage to train for the half-marathon and my knees actually hurt less. I have had a pair of these for my hiking boots for quite a while. They eventually wore out so I decided to get new insoles. I have very low arches and my feet get sore easily. Well, I tried out some of those Superfeet deals and they didn’t even come close to these heat form ones. These insoles doubled the mileage I am capable of in a day. Just ordered my second pair. I have tried other insoles and none have been as comfortable as these! Don’t waste your money on any other footbeds, these are the BEST on the market and their customer service is second to none!! Since wearing these my plantar foot pain and knee problems have gone away. I even bought a pair of soft house mocassins and put a pair of insoles in them to wear when working in the kitchen or doing housework and now I can work for hours with no pain on hard surfaces. I do not bake them in the oven because they feel better brand new and they will form to your foot after a week.